Loral constantly strives to give back to her community and society as a whole. 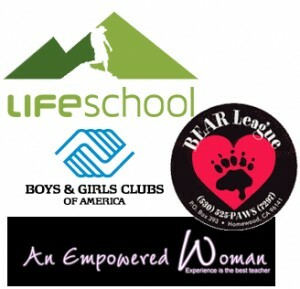 She is a frequent donor to charitable groups including, the Boys and Girls Club of America, Life School and Family Resource Centers, An Empowered Woman Foundation and the Bear League Lake Tahoe. She has developed special programs for women and for children, as well as entrepreneurs. Most recently she has formed Serve Out Loud aimed at providing discount education to United States Veterans. Loral is an exemplary role model for women and girls, a successful business owner and a consummate entrepreneur. While her programs are geared to anyone, her interest in women’s lack of financial education has always been a driving force. The model she uses in her Wealth Diva program is, “A man is not a plan.” This is meant to empower women, in or out of relationships, to take control of their current financial circumstance and future wealth and to pass the message on to their children. Her actions speak just as loud as her words when it comes to enabling children and families. Loral created the Millionaire Maker board game to teach families about money in a healthy, informative and fun way. Her “Never Pay Your Kid an Allowance,” which she created with her own son Logan, is another vehicle Loral has developed to educate children and families. Loral’s goal is to help people build the better, more secure and bigger life of their dreams. She encourages people to harness the skills they already have and begin using them to their advantage. She inspires people to reach for their dreams of a big life –whatever their definition of big is, even if they don’t know what that is in the beginning. She’s about creating, inspiring and illuminating.